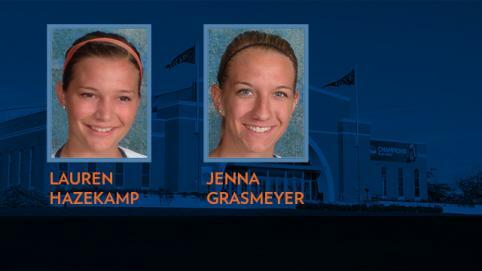 Two members of the top-ranked and unbeaten Hope College volleyball team have been honored by the Michigan Intercollegiate Athletic Association: senior Jenna Grasmeyer and junior Lauren Hazekamp. Grasmeyer is the MIAA Co-Player of the Week for matches played through October 4. The outside hitter from Jenison, Michigan (Hudsonville Unity Christian HS), slammed 46 kills for a .304 hitting percentage, and added 23 digs and 11 blocks as Hope went 4-0. Grasmeyer had 16 kills in a sweep of seventh-ranked Mount Union (Ohio). It is the third time this season and the eighth time in her career that Grasmeyer has been named MIAA Player of the Week. Hazekamp is the MIAA Specialty Player of the Week. The setter from Fruitport, Michigan (Fruitport HS), won MIAA Specialty Player of the Week honors for the second straight week as she dished out 147 assists (12.2 per set) and added 25 kills for a hitting percentage of .561 last week. Hazekamp had nine kills and 27 assists in a sweep of Saint Mary’s and added 39 assists and 10 digs as the Flying Dutch swept Adrian. Hazekamp is being honored as MIAA Player of the Week for the third time this season and the fourth time in her career. Hope (19-0 overall) returns to action on Wednesday, Oct. 8, when the Flying Dutch play at Alma for a 6:30 p.m. match.